H.R.H. 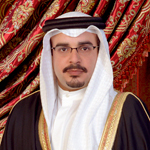 Prince Salman bin Hamad bin Isa Al-Khalifa was born on October 21, 1969. He completed his primary education in Bahrain, followed by higher studies abroad.H.R.H. obtained a Bachelor's degree in political science in 1992 from the American University in Washington, US. He then went on to obtain a Master's degree in history and philosophy from Cambridge, England, in 1994. Prince Salman was appointed Vice-Chairman of the Board of Trustees of the Bahrain Centre for Studies and Research (BCSR) in 1992, then chairman in 1995. In 1995 he was also appointed Defense Under-Secretary. H.R.H. Prince Salman bin Hamad Al-Khalifa Sworn in as Crown Prince and Appointed Bahrain Defense Force Commander-in-Chief. His Royal Highness Prince Salman bin Hamad Al-Khalifa was appointed Crown Prince of the State of Bahrain by H.M. King Hamad bin Isa Al-Khalifa then, Amir of the State of Bahrain, on March 9, 1999. The Cabinet held an extraordinary session at the Riffa Palace, during which H.R.H. Prince Salman was sworn in as Crown Prince. H.R.H. Prince Salman's various interests include the environment, culture, sports and education. Prince Salman is fluent in Arabic and English. He is married and has two sons and two daughters.